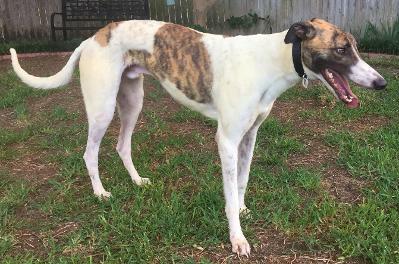 History: Kimbo is part of a litter with dam and sire that we have not seen before, although we have seen familiar names in their pedigrees – dam, CTW Kara, is part of the Kiowa Sweet Trey line and sire, Eyes Loaded, is part of the Flying Pensky line. Kimbo’s trainer decided he was not going to make it as a racer. He loves to run and tries to keep up but just couldn’t do it. He will, instead, have a life as a pet. 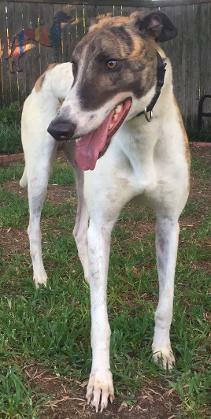 Kimbo is a gorgeous boy and should have no problem finding a forever home. 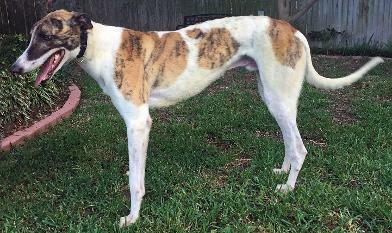 Kimbo (and his littermates) are very large with long legs. He is on the thin side and can stand to gain a few pounds. He rode very well in the car today and stood patiently (even lying on the exam table) at the vet’s office. He was a little unsettled with all that went on today and hopefully he will decide that home living is a good thing. He is very affectionate and likes to have the reassurance of human petting. Kimbo with his new dad & mom, Chris and Dustie. He will be living in Abilene, TX with them and their children. Congrats to all! 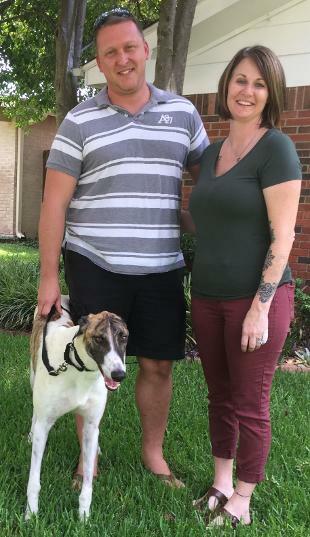 July 21, 2018 update: Kimbo has found his forever home in Abilene, TX with Chris and Dustie and their children. Congrats to all!! July 1, 2018 update: Kimbo has had quite the first week with TAGS. He has had several car rides now and lies down as soon as he gets into the car. 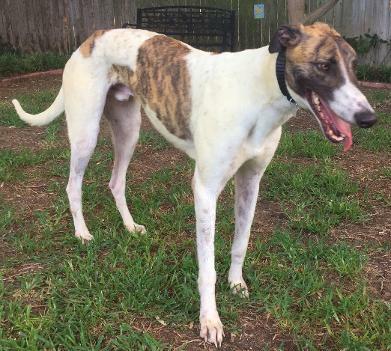 He’s been to two vets (one where he stayed overnight after his medical procedures), spent the night with a house full of Greyhounds and cats, and has now gone to a vacation foster home with cats, small dogs and a Greyhound buddy. He’s having a crash course in how to be a house pet. June 18, 2018 update: Kimbo came to TAGS for a life of retirement and to find his loving lifetime home.